Most of us have seen the popular AT&T commercial where a businessman asks children simple questions. “What’s better, bigger or smaller? Faster or slower?” The amusing answers that follow point out the simplicity of the question. The same could be asked about your restaurant’s sandwich wrap and tray liner. What’s better, boring or custom printed? Although there are many uses for plain butcher paper, custom branded paper can associate your name with the quality product you offer. Our 100% FDA approved butcher paper is great for wrapping hot and cold sandwiches and lining your food baskets and trays. Our butcher paper is available in rolls, or cut to specific sheet sizes. With custom printed paper, you can enhance your food and draw attention to your establishment. Not only does a custom designed paper dress up a sandwich, but imagine your business' name literally in the hands of the person eating your delicious food. Adding your logo, website information, artwork and more to your custom butcher paper makes a lasting impression with your customers and anyone else they see. When you wrap your sandwiches and line your trays or baskets in custom branded butcher paper, you make your restaurant that much more unique and personal. With up to 3 colors to add to your design, your customers will notice your effort to wrap your food in quality, custom paper. 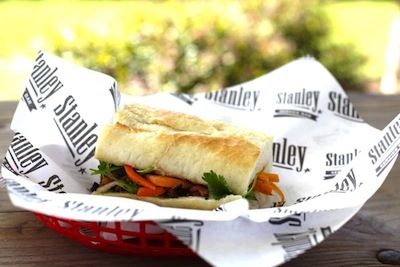 Did you know that wrapping your sandwiches in custom printed butcher paper is only a penny more per sandwich? At Oren, we have what you need when it comes to food service paper. Give us a call find out more about how our paper converting company can help your business and take a look at these ways paper helps restaurants.